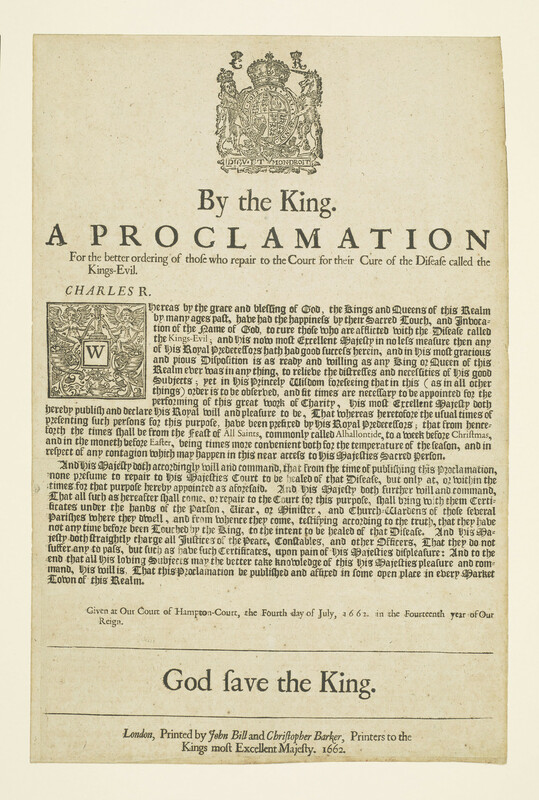 A broadsheet letterpress proclamation issued by the court of Charles II. At the Restoration, Charles II reintroduced the ceremony of 'touching for the king's evil', a practice that is believed to date back to the reign of Edward the Confessor (c.1003-66). On account of the large numbers of sufferers wishing to be healed by the king, instructions and timings for the ceremonies were issued to regulate demand. In 1662 it became necessary to issue the present proclamation, which restricted the touching ceremony to the periods between the Feast of All Saints (1 November) and Christmas.